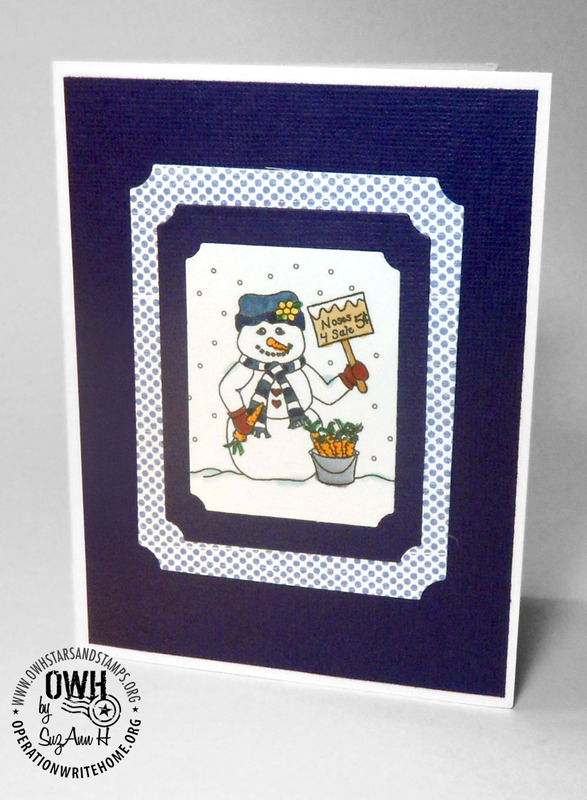 Today's featured cardmaker is SuzAnn, who also serves as an OWH board member. Check out her cute cards! How long have you been stamping? Not very long actually, just a little over 2 years. I scrapped before that but need something that was a little more instant and less "emotionally" taxing. Do you have a craft room or specific area where you stamp? I'm lucky to have half of my family room, which runs the length of my house, dedicated to my craft. I make a huge mess when I'm creating and can completely cover every surface which includes a 6 ft table, several cadenzas and chairs! 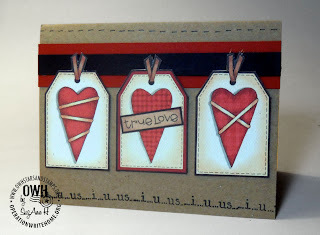 What are your favorite stamp products? I love SU! but am on a budget these days and find I'm using more digi stamps. 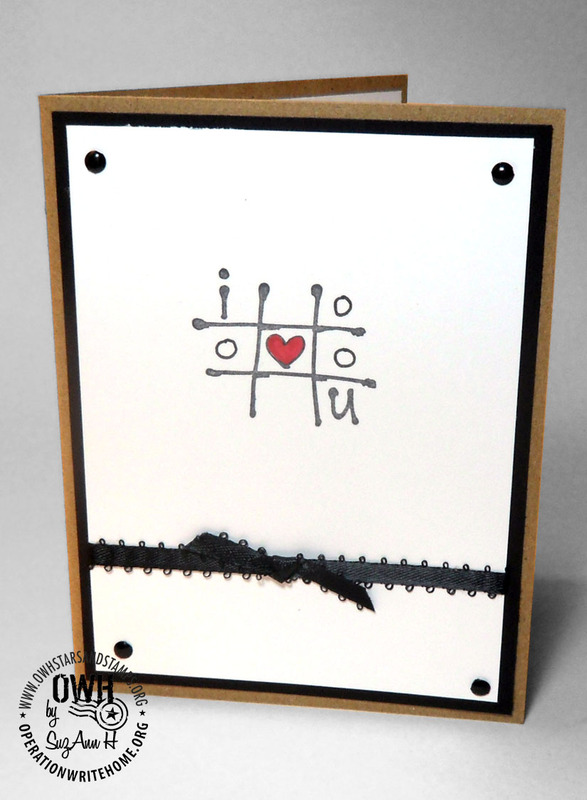 I love Bugaboo Stamps and Digi's with Attitude. Do you have a favorite technique? I'm still pretty basic and so easily intimidated by all the techniques. I'm glad S&S has the archives of techniques to refer to although I still am confounded by masking! And Sandy converted me to Copics, lol. What type of cards are your favorite to make? I like doing general themes and especially "thinking of you" or "Love/miss" you. I tend to be a little off-center when it comes to sentiments and I love puns. I'm not very good at kid's or heavily embellished cards. How did you hear about Operation Write Home? I was on another scrapping site and one of the gals mentioned Cards for Heroes. I thought it was a great idea and checked it out. Then when Sandy personally replied to a question, I was hooked! What motivates you to make cards for our heroes? I found CFH/OWH during a very down time of my life and it gave me something outside of myself to focus on and could feel good about. I absolutely agree when Sandy says that making cards blesses many people: the card maker, the shipper that packs it, the soldiers that select it and the person that receives it. So much BANG for your buck! Our heroes and their families are offering everything to protect our freedoms and a card is such a simple way to say thank you and let them know they aren't forgotten. How did you become involved with the board? Sandy emailed me a year ago asking me to be on the board and to serve as the secretary. I'm annal by nature and love reports so I guess she picked up on that, lol. What has being on the board meant to you? I love the board members and our meetings are delightful - everyone is so engaged and excited to support OWH in any manner. I love telling people about OWH and that I'm on the board, especially when I ask for donations. The JoAnns by me was so much fun to visit during their Craft for a Cause contest and especially after we won 2nd place! I feel like a member of a great big sorority. Thanks, SuzAnn, for the work you do for our heroes! SuzAnn doesn't have a blog, so please leave your comments for her here. 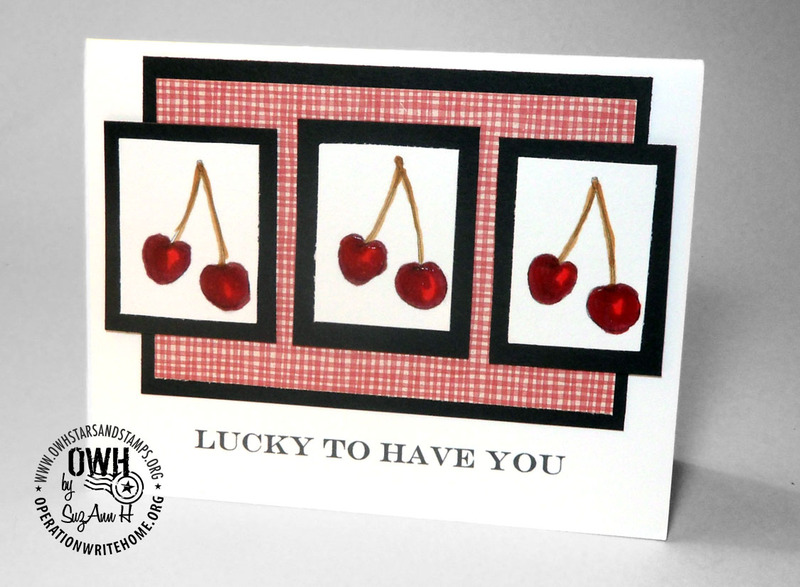 very pretty cards SuzAnn, never would guess you are a fairly "newbie". 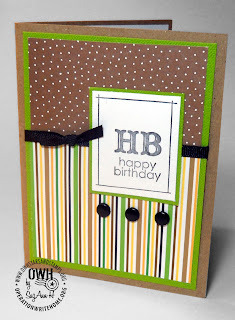 Beautiful cards - I totally agree about being able to cover every available surface - plus the floor. Thanks for all you do. Wow, your cards are so great. Keep up the great work. Wonderful cards! Unusual techniques are not really my thing either. These cards are proof that "basic" can be truly lovely. Thanks for all you do for OWH. thanks ladies! I just wanted to point out that the last card is a CASE of another card posted here on S&S. I don't remember who it belonged to but thanks for the inspiration!!! 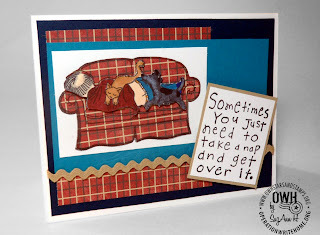 SuzAnn, your cards are wonderful and the one with the fella napping on the couch had me laughing out loud! That's a good way to end 2010! I thought that last card looked familiar!! You did a wonderful CASE SuzAnn! Thanks for sharing your story and the beautiful cards. Great job! I love your cards. 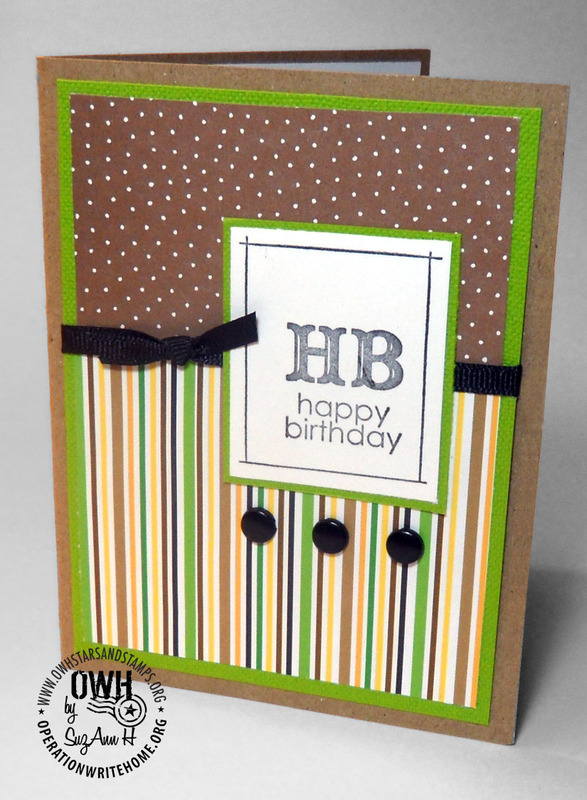 Clean designs, classy, great color choices. I would never guess you'e been doing cards for such a short time either! Way to go! Your cards are great, I especially like the heart card. Thank you for sharing your craft and your background - I am a firm believer that sometimes "less is more" and the simple can speak volumes. 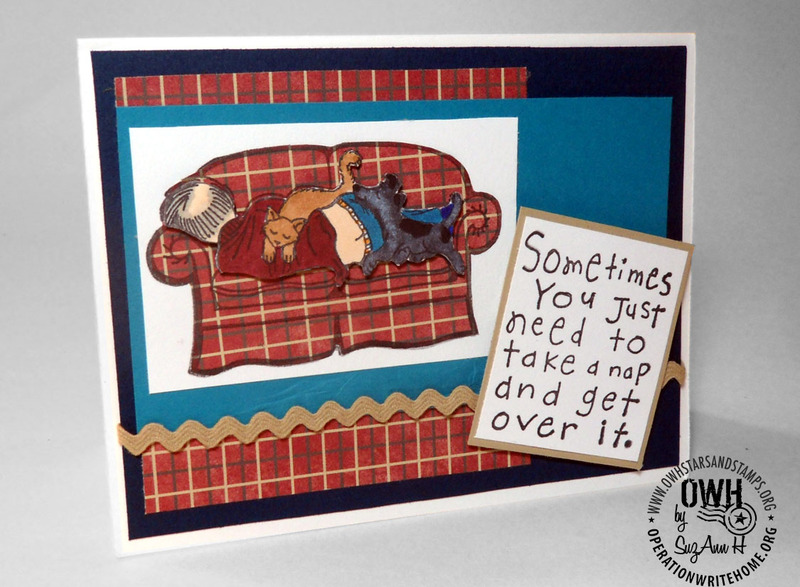 My favorite is the napping grampa - the paper piecing is far from basic to me :) The sentiment is perfect for the image. Thanks for sharing! Wonderful cards. Thanks for all the time and work you do for OWH. Love your cards! Are they all Digi's? Love the style of your cards. I wish you had a blog so I could CASE some of your work. LaDonna, no they all aren't digis. 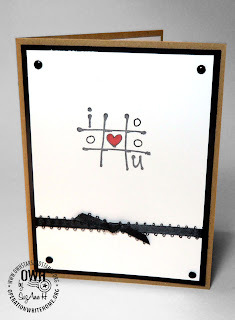 the tic tack toe love is VAP! and usually can be found in the $1 bin at Michaels. the nap sentiment is Inkadinkado. the napping grampa is from a company that sells um or mounted but I don't remember which one! and the happy birthday was RAK'd to me but is unmounted rubber. 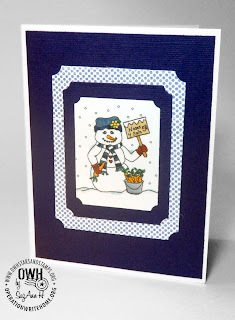 the cherries are a digi from lindsays stamp stuff and the snowman is from deedees digis. Your cards are pretty amazing! And I'm with Crafty56... I wish you had a blog so I could see more of your work!! 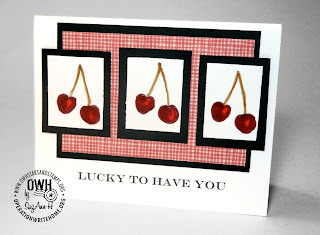 Great job and Congrats on being a featured cardmaker! !